Bow and stern thrusters are critical components on any mega yacht. Not only do they increase the maneuverability of large vessels but also play an important part in the safety of other boats around the docks particularly in larger vessels is tight spaces. Most of these systems are driven by hydraulics on vessel from 80-180 feet but others are driven by electric motors. 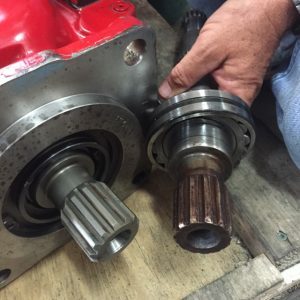 When hauled it is a good idea to drain the gear oil out of the leg to check for water or metal. If no water is present, add fresh gear oil and the service is done. New seals can easily be added depending on the brand and model of thruster. 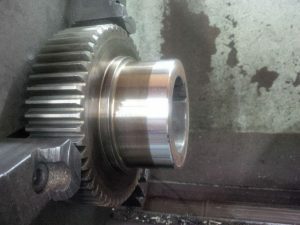 If salt water is present, the gear leg can be removed for disassembly and assessment on gears and bearings. More often, we find oil in the tunnel beneath the propeller a few days after haul-out that indicates leaking shaft seals that would need to be replaced. While we typically do not change out zincs unless requested, zincs for bow and stern thrusters are specific to the brand of thrusters so that would be included in the maintenance service. 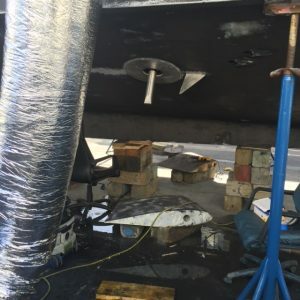 We were recently called on to service a bow thruster on one of our repeat clients where the propellers complete broke apart due to improper installation. We were able to secure new props and rebuild the thrusters to “like new” condition. Because your bow and stern thrusters are in constant contact with sea water, we recommend that you inspect and service them twice a year to ensure that your yachting experience in close quarters and safe and stress free. Our hydraulics team was recently contacted by a welding contractor at Lauderdale Marine Center to remove a PTO pump off a 150’ Palmer Johnson’s main hydraulics system so they could gain access to the ship to perform their work. What started as a fairly routine job quickly turned into something much more. The splines on the unit had seized, taking what would have been roughly a half day of work to several days. Typically, we would construct an A-frame rigging to hoist the PTO pump out of the boat but in this case, we were forced to cut the unit apart and remove it in pieces. Because of this, the ship now requires a whole new replacement unit. 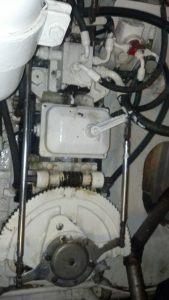 Once it was uncovered that the first PTO pump could not be removed using standard procedures, the ship’s engineer had us remove the second pump to check the splines. Fortunately, the second unit did not have the same problem. We highly recommend removing, refurbishing and re-installing these PTO pumps every three years or so for routine maintenance. Just like the top-end of a windlass which should be removed, cleaned and re-installed with new grease ever couple of years; PTO pumps need to be serviced to ensure that they do not experience these types of problems with seizing. 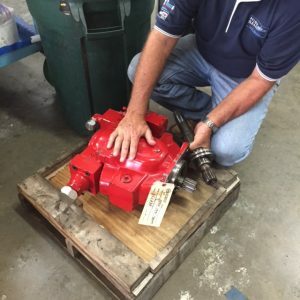 A proactive approach to maintaining these critical components of your hydraulics systems will pay big dividends and potentially save thousands of dollars in the end. Fort Lauderdale International Boat Show is Right Around the Corner! And we will be there with Lauderdale Marine Center in Booth #640. Stop by and visit with us. We will have our technicians and mechanics there from both High Seas Hydraulics and High Seas Yacht Service to answer any questions you may have on running gear vibrations or hydraulic systems. Hope to see you at the Show! Our Hydraulics team was recently called upon to work on a PTO (power take-off) pump that was driven off the vessel’s main engine transmissions. Removal of the pump was extremely difficult due to corrosion between the pump shaft splines and the coupling. The corrosion was due to exposure to saltwater and normal wear and tear. In the marine business, the internal and external splines that make up the coupling usually reside on different pieces of equipment supplied by different vendors. The SAE Involute spline standards are the most commonly used for shaft diameters between ½” and 2”. The tolerances are loose enough to insure multi-vendor interchangeability while still providing torque transmission significantly higher than a keyed coupling. The tight fit avoids any lash and excessive wear in the splines over the life of the pump. There are many benefits in using spline shafts in place of a keyed shaft for this application. The spline connection offers a load distribution which is equal along the teeth sides enabling both to rotate together. Consequently, this load produces a longer fatigue life compared to the keyway drive. In this case, the corrosion had damaged the spline surfaces and locked the two parts together. What would normally take a couple of hours, ended up taking almost two days to complete. Once finally removed, it was apparent that splines were damaged beyond repair. The only solution was rebuilding the pump with a new shaft and the correct size splines. Splines come in many different sizes and types, so replacement must be an exact match. Once the pump was rebuilt, we re-assembled with the main engine transmission and installed it back in the boat. By rebuilding the pump, we saved the captain thousands of dollars. A 106’ Westport yacht was recently hauled at Lauderdale Marine Center for a variety routine maintenance projects including shaft work, bearing replacements and an overhaul on several hydraulic systems. 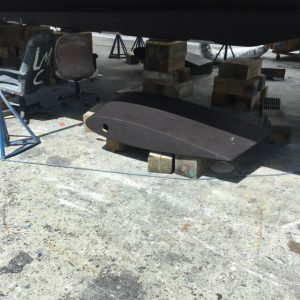 To streamline the process and help the captain and crew better manage the project, they contracted with both High Seas Yacht Service for the running gear portion and High Seas Hydraulics to handle the hydraulics work. Our running gear mechanics inspected the shafts to ensure they were straight and aligned and replaced the bearings and seals. 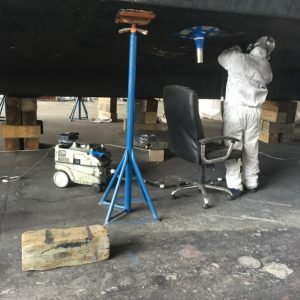 Normal wear and tear associated with running the vessel and prolonged exposure to salt water makes this task a necessary evil for properly maintaining the boat. As seen in the adjacent photo, there was a visible gap where the cutlass bearing adjoined to the shaft. We were also commissioned to replace the seals on the lower stabilizer fins. ABT Trac, one of the more popular brands, recommends changing the lower stabilizer fin seals every couple of years but at least every six years depending on use. The components on the stabilizer are constantly working except is absolute calm seas, so the wear and tear can be considerable. After dropping the fins, we proceeded to change out the old lower stabilizer fin seals with new ones, check the hoses and cylinders, then reassembling the units. In addition to the routine maintenance on the stabilizer systems, we flushed the entire hydraulic system using the simple drain, filter, fill approach commonly referred to in our shop as a DFF. This type of flush is more of an “oil change” and is part of routine maintenance. It is not appropriate where a more serious condition such as water, metal particles or other contaminants are found in the oil. 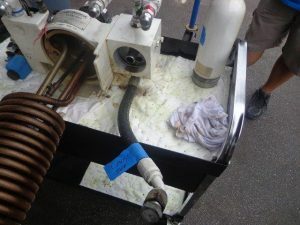 The process calls for draining the hydraulic tank, changing out the filters and refilling the tank with hydraulic fluid. To round out the work on this Westport, we did an overhaul on the bow thruster, single Maxwell windlass, the boat’s heat exchangers and the hydraulic steering system which was slow to respond. From running gear to hydraulics, our teams at High Seas Yacht Service and High Seas Hydraulics, make easy work of maintaining the systems that make your vessel safe and operating smoothly. To keep your stabilizers in top working order, it is important to follow the manufacturer’s recommended scheduled maintenance to ensure smooth sailing in rough seas. ABT Trac, one of the more popular brands, recommends changing the lower stabilizer fin seals every couple of years but at least every six years depending on use. The components on the stabilizer are constantly working except is absolute calm seas, so the wear and tear can be considerable. 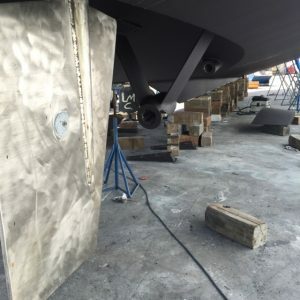 When an 80-foot Limon Heesen yacht was hauled at Lauderdale Marine Center, our team at High Seas Hydraulics was tasked with changing out the lower stabilizer fin seals. We first had to drop the fins from the vessel before accessing the lower stabilizer fin seals. 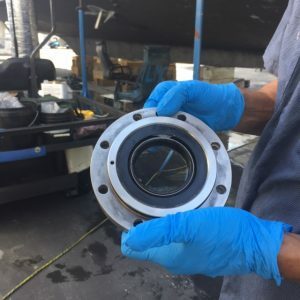 It is important when having this service performed on your yacht that you select a yard and a hydraulics company that has the proper tools and training to perform the job. At High Seas Hydraulics, we believe in investing in our technicians to further hone their skills. That is why we have send some of our hydraulics technicians to ABT Trac for training on their systems. Those technicians are now Factory Trained and Certified to work on all types of ABT Trac systems. After dropping the fins, we proceeded to change out the old lower stabilizer fin seals with new ones, apply motor oil, check the hoses and cylinders, then reassembling the units before sea trialing the boat to ensure everything was in proper working order. Stabilizers are an important component in keeping your yacht comfortable and safe when encountering rough seas. 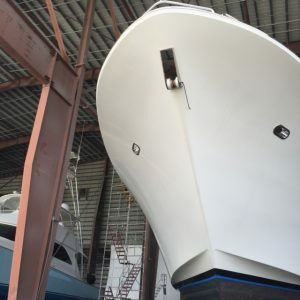 When a 118-foot yacht was hauled out at Lauderdale Marine Center for a full refit including paint, our hydraulics team was called upon to refurbish some of the vessels hydraulic parts including its deck crane and side boarding ladders. After a thorough inspection, we removed the units and rebuilt them to “like new condition.” We stripped the units for paint and replaced all hydraulic hoses, cylinders and hardware. Once the other work is completed on the yacht, we will re-install the side boarding ladders and crane. 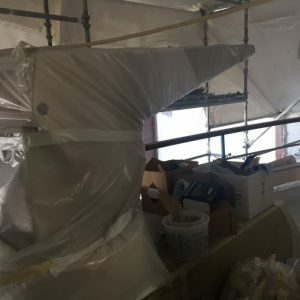 The “new” side boarding ladders and deck crane will complement the look of the refitted vessel and provide years of service for future voyages. When an 85-foot Ocean Alexander hauled out at Lauderdale Marine Center recently, the vessel needed repairs on both her hydraulic stabilizer systems and running gear work along with a general re-fit and painting. 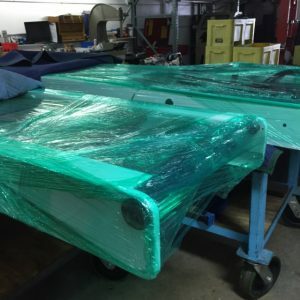 The Captain hired us for the hydraulic and running gear work to streamline the process and have the work performed using a single point of contact for the job. 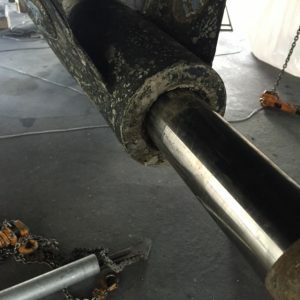 Our team of hydraulic technicians at High Seas Hydraulics tackled the routine maintenance on the ABT Trac stabilizer systems, while our running gear mechanics at High Seas Yacht Service pulled the shafts and sent them to our machine shop, Straight Line Marine for straightening. Once the shafts were ready for re-installation, we used an optical scope to ensure precision alignment. This Captain was on a tight deadline for launching and working with our teams gave him the peace of mind that he would be on his way on schedule. Using High Seas Hydraulics and High Seas Yacht Service for this project made perfect sense for coordination and project management to get the job done right and right on time.